Today is the last day to donate to Field Camp Futures! Thank you for joining us at Professor Valley Field Camp! We’ve enjoyed sharing this special place with you. At the end of every field camp, everyone gathers together for a special closing ceremony to commemorate their experience and carry what they’ve learned forward. What do students take home from field camp? Each visiting group at Professor Valley Field Camp is evaluated on their experience; what they learned and what could be improved. Below are direct quotes from last year’s participants. You’ll find that many lessons go beyond knowing the names of geologic formations and plants! Donate today to be a part of these take-home lessons! What else makes Professor Valley Field Camp so special? It’s a whole lot of fun! Plus, each hands-on educational activity is an opportunity to practice cooperation. 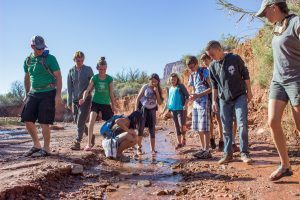 Canyonlands Field Institute teaches through experiential learning and uses hands-on lessons to challenge students (and teachers!) to think outside of the classroom. 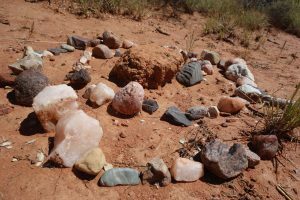 Experiential learning, or learning by doing, has been the cornerstone of the programs run by the Canyonlands Field Institute. This type of teaching channels kids’ energy into learning; letting them have fun and be active while actually learning about the world around them. Not only is this a more fun way for kids to learn, but studies have shown that we learn better by doing! Donate to Field Camp Futures today to support this immersive learning environment! Field Camp Futures Fundraiser Starts Today! 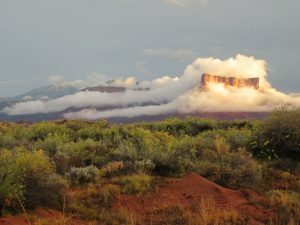 At Professor Valley Field Camp, Canyonlands Field Institute naturalist guides serve one group at a time with a variety of engaging activities. Students learn about desert plants, animals, geology, public lands management, and how to interact with a wild landscape. These educational lessons instill values for taking care of the landscape in their own communities through consideration, communication, and cooperation. This year we had a great overnight volunteer weekend setting up our field camp. Between our volunteers and the Green 2 team of the AmeriCorps NCCC (National Civilian Community Corps) we managed to get a lot of the tipis raised! As you will see in the short timelapse video below it was a lot of work, as well as, a lot of fun. Getting to spend the weekend out at field camp with this great group of folks was a truly memorable and entertaining way to open up our field camp! The Colorado River; a source of refreshment when you are thirsty, a way to cool off in the summer heat, and one of the best rides in the world. 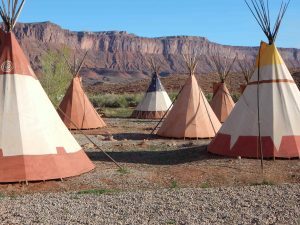 People come to Moab from all over to journey down the river in rafts, kayaks, and other watercraft, and the guides who work it are trusted to get them down it in a safe yet exciting manner. It’s no wonder so many Moab kids dream of one day becoming a river guide. Well now’s their chance to learn the skills that truly make the river guide, all while testing out those skills as they take a six-day adventure down the river! 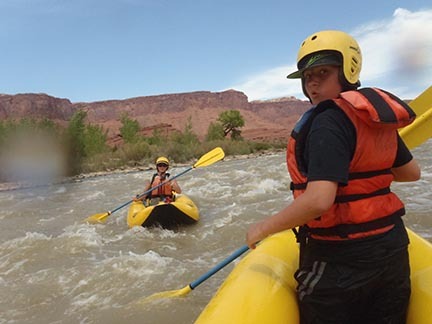 Canyonlands Field Institute’s brand new camp for the summer, River Adventure Week for Teens, gives High School-aged kids the opportunity to learn how to read the river, as well as how to rig the boats and set up a successful river camp, just the way the guides do it. 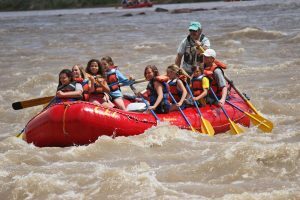 The adventure takes them first through beautiful Horsetheif and Ruby canyons, then on to the world-class rapids of Westwater Canyon before continuing on to the Hittle Bottom Boat ramp near Moab. Future river guides should click here where they can learn more information about this camp and to register their spots.